To discover a new play by Arthur Miller in his centenary year represents quite a coup. The Hook is actually a version of Miller’s unproduced 1951 screenplay, adapted by Ron Hutchinson, using only Miller’s heightened everyday language, from numerous original drafts painstakingly collated by Dacre over six years. Elia Kazan was to direct this tale of corruption among Red Hook longshoremen, but pressure was put on Miller by Hollywood unions and the FBI to make some of the villainous characters communists. He refused and withdrew the script. Miller’s life was changed: he met Marilyn Monroe in Hollywood, later developed A View from the Bridge from similar material, and his friendship with Kazan (director of the Pulitzer-winning Death of a Salesman) soon ended when Kazan named communist sympathisers before the House Un-American Activities Committee. Kazan directed the similarly-plotted On the Waterfront in 1954. There are times in The Hook when a long shot would provide welcome respite from the frantic, shouty setting up of the environment of Brooklyn docks in the first half. And there is less time in the tumbling, filmic scenes for the complexity of domestic relationships found in other Miller plays. 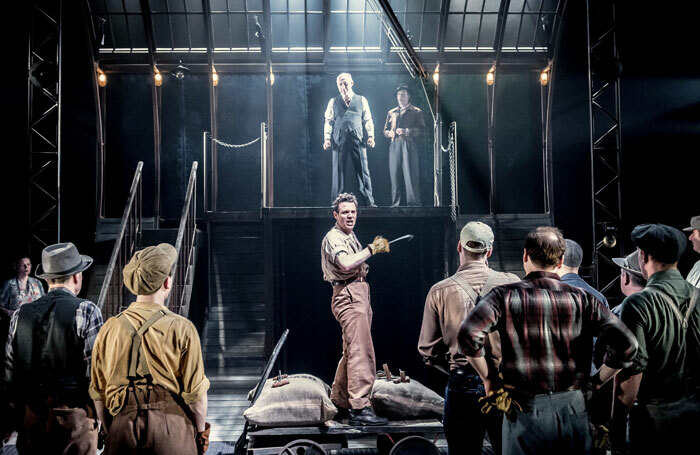 But all the fierce moral intensity of early Miller is here, embodied in a skilful production, strong on set design and lighting, with, at its centre, a full-bodied performance by Jamie Sives as Marty Ferrara, who risks all to stand up to corrupt union bosses. Local people successfully suggest a busy, interdependent community. The final moment, with Marty brandishing the vicious-looking hook used to unload cargo, is a surprisingly upbeat call to revolution.